Samuel L Jackson, the Hollywood action hero known for screaming about snakes on a plane somewhere will play Dr. Martin Luther King Jr. in Katori Hall's The Mountaintop, which begins previews next month on Broadway. Why not an actor such as Jeffrey Wright who has more recent stage acting experience. Also, we know that Mr. Wright can play Dr. King from his very credible performance in the HBO film Boycott. I wonder if last year's Lincoln Center's fiasco of a production - A Free Man of Color - had anything to do with it. Will Mr. Jackson make us believe that he is the humanized Dr. King? After seeing him in Rodrigo Garcia's wonderful film mother and child I have some hope that he just might be able to play a non-action hero with some dignity. Let's move on the role of Camae, the maid who delivers room service to Dr. King's motel room on the eve of his death. 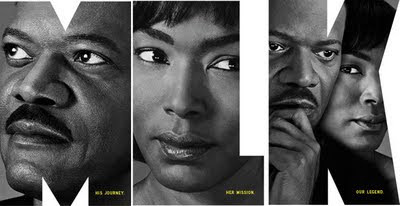 The character, named after the playwright's mother (the inspiration for The Mountaintop) is supposed to be mysterious. Mysterious how, I don't know and I can't wait to find out!!! There was some drama behind the drama about who would play Camae. In the end, the role went to Angela Bassett, not Halle Berry, who could not take it for personal reasons related to the custody of her child. While Ms. Berry holds an Academy Award (for her role in Monster's Ball), Angela Bassett, only a nominee for her portrayal of Tina Turner in What's Love Got to Do With It, is the far superior actress, even though I sometimes think that she overacts. Just my thoughts - I know many will disagree. From everything that I've read about the role of Camae, the character seems to be a younger woman. Lorraine Burroughs who played the role in London is 30. I wonder if the veteran 52 year old Ms. Bassett and the action hero Mr. Jackson (no spring chicken at 62 - Dr. King was 39 at his death) will take the play in a completely different direction.